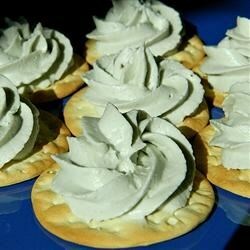 "Blue cheese mousse is a great cracker topper or vegetable dip. Use a pastry bag with a round tip and pipe onto your favorite cracker. You can top with favorite vegetables sliced thin." Puree blue cheese and cream cheese together in a food processor until completely smooth; transfer to a bowl and season with kosher salt and black pepper. Beat heavy cream in a glass or metal bowl until soft peaks form. Lift your beater or whisk straight up: the whipped cream will form soft mounds rather than a sharp peak. Fold whipped cream into the blue cheese mixture, stirring until the mixture is creamy with no lumps. Transfer mixture to a pastry bag with a round tip for piping. This recipe was the favorite of the party. It was great on a cracker. I am very happy to have the recipe to try on my own! Blue cheese and Port wine are a classical pairing. For desert, I piped decorative blue cheese mousse rosettes on servings of port wine gelatin. It was voted best dish at the dinner party. This was a simple recipe and tasted fabulous on crackers and veggies for a party dip.